Depending on the provider, the beginning of the tour takes place between 5 pm and 7 pm. The Tapas guided tour takes place late in the afternoon or early in the evening. We are comparing Tapas Evening Walking Tour of Barcelona Prices from leading ticket suppliers and Try to find you Cheap tickets prices on the market. An overview of the culinary scene, architecture and culture of the capital of Catalonia. A specialised guided tour that introduces the best of the regional and Spanish food. 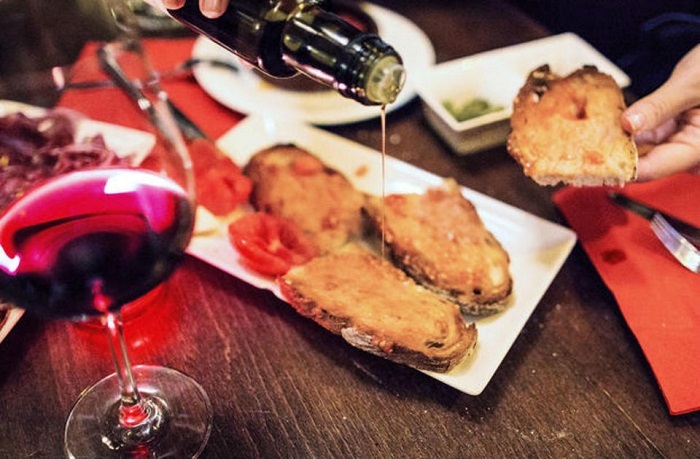 An introduction of the best Catalan wines and their successful combining with cold and hot tapas. Visiting various eateries and points of interest related to the dining scene and history of Barcelona. This interesting guided tour is suitable for everyone wishing to know more about the city and its extraordinary cuisine. The tour is suitable for people of various fitness levels while eating tapas is beneficial for one's health. If you are a fan of wines, joining the guided tour is an excellent solution for you to find out what wines of Catalonia are the best. Your Experience With Tapas Evening Walking Tour of Barcelona? Visit specially-selected eateries by your insightful guide and taste several cold and hot tapas. Hear stories of Barcelona and have an overview of its cultural side. Get around through the streets and squares of the renowned Gothic Quarter and along La Rambla, the main street of the capital of Catalonia. Learn what wines to combine with what tapas. Acquire useful knowledge about where to find eateries frequented by the locals. What Tapas Evening Walking Tour of Barcelona Includes? A local guide that specializes in local cuisine. A selection of a few places that serve the best tapas in Barcelona. Dining tips for the best dining experience that only a local can reveal. An overview of the city as you walk between related points of interest through the historical center. One thing you will learn during the tour is how to order tapas - not all at once, but rather on the go. That way, you avoid eating cooled specialties that are best eaten warm. What many people like about tapas is that you pass them on at some point. At pintxo bars, you don't make orders, just take tapas and help yourself. Don't throw away sticks at pintxo bars so the hosts know how much to charge you. Travelers Reviews about Tapas Evening Walking Tour of Barcelona? Travelers state that the tour is insightful in many ways, allowing vacationers to get acquainted with the dining culture of Barcelona. They also enjoyed discovering various areas of the city while getting between points of interest. People that joined the tapas guided tour had a personalized experience in a small group. Participants think highly of the tour since the tour guide took them to authentic places. Finally, many of them had a great experience while combining food and drink in the way they would never attempt if it weren't for the tour. The tour involves a few kilometers walk, so joining it isn't the best option for people with disabilities. Paper and mobile vouchers are both valid for taking part in the tour. Withdraw your order no later than 24 hours prior to the scheduled time to receive a full refund. Arrive somewhat hungry at the meeting point. If you have some special dietary requirements, please inform the provider beforehand. Since tapas are about sharing as much as about eating, you will be expected to share your orders with other people.